Most items are $20 and under, including furniture, books, CDs, clothes, coats, lamps, housewares, pots, handbags, candle holders, belts, and much much more! Proceeds to benefit Nave programming. They also say there will be "deep discounts" during the last half-hour. 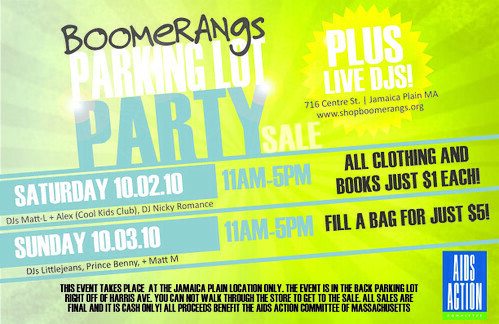 While it's already a good place to find cool stuff on the cheap, Boomerangs is having a parking lot sale. What makes it a party? DJ's, baby. I suspect you'll hear the the most underground of the underground that hipsters pretend to know -- or Kool and the Gang. Maybe both. And the prices sound pretty darn right to me! I assume it will be their bags, because we don't want people to bring giant duffel bags, etc. Proceeds always benefit the AIDS Action Committee, so buying stuff is a karmically excellent thing to do.